Here at Village Aid we’re delighted to announce our latest partnership! Our fantastic EQM partner, the Bakewell Soap Company, has launched a special new line using bee products. Made with goat’s milk, honey and beeswax, the soap and lip balm are popular with those suffering from dry skin conditions such as eczema & psoriasis. The products are entirely natural, free from parabens and artificial ingredients. Beekeeping soap and lip balm on display in Bakewell Soap’s shop. 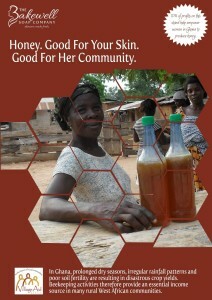 The poster explains the benefits to both your skin and women’s livelihoods in rural Ghana! 10% of the profits will help Village Aid to support beekeeping activities in rural Ghana. Prolonged dry seasons, irregular rainfall patters and poor soil fertility are resulting in disastrous crop yields. Beekeeping activities provide an essential and sustainable income source for many women and young people. You can find out more about our beekeeping project here. PREVIOUSClimbing for Safe Water Team complete their 13,225 feet Trek!